When you learn how to make bean recipes you will find they can be made with endless types of beans. First there are fresh beans or fresh beans which have been canned or frozen. These include a wide range of green beans. Within the heading of green beans there are also many different kinds such as string beans or stringless green beans each having unique flavors. The American English green bean or also called French bean has a special place when you learn how to make bean recipes. Similar to green beans are the wax beans; also a deserving place in the recipes. Next we have a huge variety of dried beans to use in our cooking; some of these being the Navy bean, different varieties of kidney beans, black beans, pinto beans and many more. Throughout our history, these dried beans have been known for the cheapest way of feeding a family. When I was young most homes had a large pot of beans cooking at least once a week because they were so economical. In our home bean dishes were as common as mashed potatoes which were also cheap to make and very filling. Depending on how you season them, they can be very flavorful and delicious. When you learn how to make bean recipes there is such a variety of beans to choose from that you could include beans in your diet every day and not even realize it. The different beans whether it is the fresh ones or dried ones can be intermixed in many delicious great bean recipes. The flavors blend so well together with other vegetables like corn recipes. Another valuable point about beans is that when combining many of the beans with grains like rice in a recipe, it makes a full protein providing a great healthy meatless meal. There are also many nutrition values of beans giving more reasons to include them in your diet. 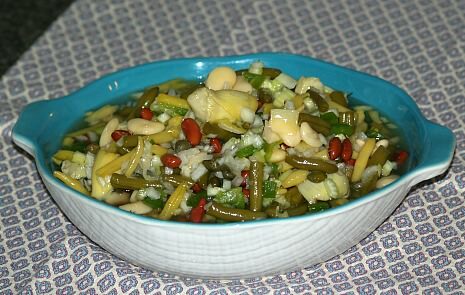 This bean salad recipe in one of my favorite recipes; it is a hit every time I prepare it for company with everyone requesting the recipe. Boil the sugar, water, vinegar and salt, and then cool. Pour the liquid over the beans and vegetables. Refrigerate for one day, before serving. When I was young, I never thought I would ever enjoy eating any bean recipes like the following one. Neither of the two main ingredients were on my list of favorites; butter beans and artichokes. However, since I have aged both have become very pleasing to my palate and with the seasonings in this recipe, they are delicious. Cover the artichokes with the lemon juice. Cook beans according to package directions. Cook onion and celery in combined oils until translucent. Add beans, dill and basil. Place in a 2 quart greased casserole dish. Arrange artichokes on top, and pour lemon juice over all. Cover and bake for 30 minutes. Turn artichokes over, and bake for another 15 minutes. Serve hot. As you probably know, sour cream is one of my favorite ingredients, even in bean recipes. This is a perfect example. This is one of the delicious casserole meals; the cheese adds some protein and it is very flavorful with the different vegetables and seasonings. Preheat oven at 350 degrees. Combine all ingredients except Italian bread crumbs, sour cream and butter. Mix together and then blend in the sour cream. Pour into greased casserole dish. Cover with Italian bread crumbs, and then dot with the butter. Bake for 45 minutes. Some of the bean recipes have great combinations of ingredients. What a mixture in this one; black beans, corn and tomatoes. After adding the cumin and cilantro, you have great flavor! For a little more spice in this Mexican salad recipe add a few hot pepper flakes. Mix all ingredients except black beans and tomatoes. Refrigerate for a few hours. Add the black beans and tomatoes before serving. Most popular of all bean recipes are baked beans. 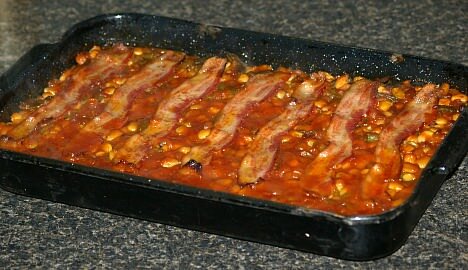 We all love baked beans; especially for picnics. This baked bean recipe is really special using a combination of four different kinds of beans. After seasoning with onions, bacon and brown sugar, what flavor! Preheat oven to 350 degrees. Brown onions and bacon together. Add the brown sugar, vinegar, mustard, salt and pepper. Blend together. Mix with the beans and bake in a greased casserole dish for 1 ½ hours. Learn how to make bean recipes with this easy refried bean recipe. Sort through beans discarding all foreign materials mixed in. Thoroughly wash beans in fresh water; drain well. Combine beans, water, 1/3 CUP of salsa, onion, salt and garlic in Dutch oven. Bring beans to a boil; REDUCE heat and simmer3 to 4 hours. NOTE: Stir occasionally until beans are soft and easy to mash. Drain beans and RESERVE liquid; place beans in large mixing bowl. Add butter and REMAINING 1/3 cup of salsa to beans. Beat on low speed of mixer until beans are smooth. NOTE: Add reserved liquid if desired to reach the desired consistency. Season with salt to taste; makes 4 ½ cups.